Yesterday afternoon , I spent 3rs walking the grounds of the Forestry Farm Park. Evening Grosbeak - Four of these birds flew directly over me in full 'flight song'. Had I not seen the yellow, I might not have believed it myself, as they are so seldom seen in town these days. Great Horned Owl - I flushed a very large white individual from a stand of Jack Pines. I found it again later when I heard 4 Chickadees going ballistic. Common Redpoll - Given away by their call, I found at least 10 of these. White-breasted Nuthatch - 2 near the gardens. Red-breasted Nuthatch - 1 in a tree next to the main office. White-throated Sparrow - 1 straggler also near the gardens lurking under some juniper. Dark-eyed Junco - 1 - Seen fleetingly ,right at the main entrance in some dense evergreen shrubs. American Robin - 5 over-wintering birds at the far south of the park, sheltering from the wind. Black-billed Magpie - 7 in various areas. Common Raven - 1 near the wedding platform area. House Finch - A flock of 11 birds near the entrance. Hairy Woodpecker - 1 heard near the zoo office. House Sparrow - 5 or 6 chattering away in some bushes next to the mountain goat pen. Absolutely love your site. Would love for you to register and be a part our community. I know he or she wouldn't stand for it, but I can't help wanting to feel that lovely fur. What a cutie! Thanks, Nick. 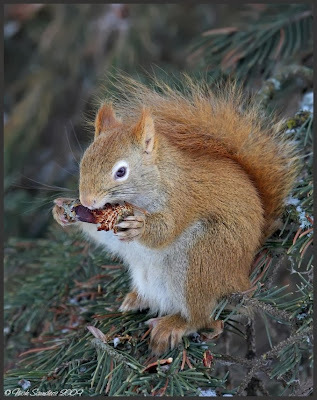 ...that little squirrel is just adorable. 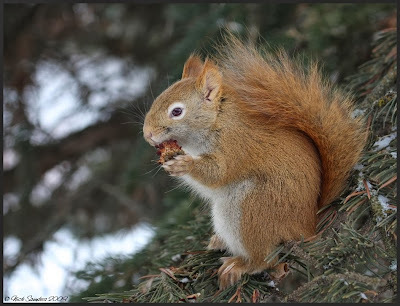 He actually looks like the real Squirrel Nutkin!